Although Asia is still expected to maintain steady growth in 2016, rising debts are a potentially major threat, the IMF noted in its economic outlook report released on Tuesday. Corporate-debt-to-GDP ratios have increased faster in Asia than in other major parts of the global economy since 2009 and are particularly high in the Chinese mainland, Hong Kong and South Korea, according to the report. The rising corporate debts and the low profitability of some corporations are considered medium-term challenges, but may not have an immediate impact on economic growth in many Asian countries and regions as the risks of high leverage have already been taken into account, Changyong Rhee, director of the Asia and Pacific Department of the IMF, was quoted as saying in an interview with Bloomberg that was published on Tuesday. However, financial sector vulnerabilities in China remain a risk, especially as the economy needs to deleverage, the IMF pointed out in its report. China had 60 percent of total debts concentrated in the corporate sector as of the end of September 2015, higher than in the US, Japan, the EU and the UK, Fitch Ratings noted in a report sent to the Global Times over the weekend. And the country's GDP growth has become highly dependent on credit growth, it said, with about 83 trillion yuan ($12.8 trillion) in new credit being issued from 2009 to 2014. Unlike companies in Western countries, which can issue stock or bonds to raise capital, Chinese firms are overwhelmingly dependent on indirect financing, such as bank loans, said Zhuang Jian, macroeconomist at the Asian Development Bank. "High corporate debt ratios generate risks, which may become a burden on banks," he told the Global Times on Tuesday. IMF analysts suggested on April 26 that China urgently needs to tackle its debt problems, especially excessive corporate debt, the fund's website showed. The country's corporate-debt-to-GDP ratio has risen to 160 percent, which is relatively high compared to other developing economies, according to IMF analysts. The analysts also mentioned the need to fully assess credit risks in the country's corporate sector, as the number of companies defaulting on debts has been increasing recently. For example, Shanxi Huayu Energy Co, 49 percent owned by State-owned China National Coal Group Corp, announced on April 6 a default on bond payments, which reflected difficulties in the coal industry, Fitch said. A few days later, Dongbei Special Steel Group Co, a State-owned enterprise (SOE), announced that it would miss a payment on short-term debt for the fourth time in a month and a half, media reports said on April 28. Although the nation is expected to achieve GDP growth of 6.5 percent in 2016, there are a number of macroeconomic imbalances that continue to pose downside risks for the Chinese economic outlook and the country needs to further strengthen the regulatory management of risks in shadow banking over the medium term, Rajiv Biswas, Asia-Pacific chief economist at IHS Global Insight, told the Global Times on Tuesday. 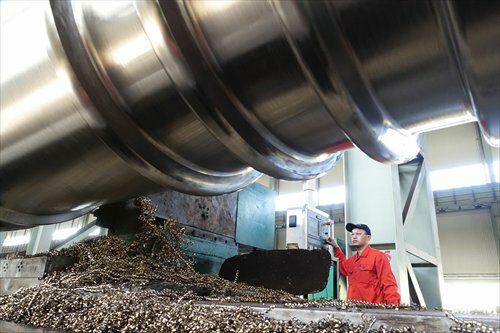 As China makes the transition to a new growth model, it has come up with various techniques to tackle the debt issue, such as converting nonperforming loans into equity and repackaging those loans and selling them as securities to the market, Zhuang noted. "However, there should also be scrutiny of those converted debt assets in order to avoid larger financial instability," he said. The strategy of using debt-equity conversions will help to address the problem of high leverage, Biswas said, adding that the reduction of corporate debt levels as a share of GDP will take a number of years to implement. "This risk factor will continue to be a key strategic priority for the Chinese government and the financial authorities," he said. Improving the allocation of credit and reducing the dependence of growth on credit will help to rebalance the economy away from debt-led investment, according to the IMF's report. In this regard, leveling the playing field between SOEs and the private sector, and continuing with reforms to improve corporate governance to rekindle the equity markets as a source of corporate financing will remain priorities, it said. "Besides deleveraging, Chinese companies should be more market-driven in order to improve their profit margins instead of developing through borrowing," Zhuang said.